Human research studies and anecdotal evidence indicate that melatonin supplements can be an effective and side-effect-free sleep aid both for adults suffering from insomnia. Melatonin is a pharmaceutical grade, purified naturally secreted from the pineal gland. It should only be taken at night for optimal results. The hormone melatonin is naturally produced by the pineal gland, a core-shaped structure in the brain. The body’s pattern of melatonin production is similar to that of the other “anti-aging” hormones, human-growing-hormone (HGH) and dehydroepiandrosterone (DHEA). Throughout early life, melatonin is produced in abundance. Shortly before puberty, though, the production of melatonin begins to drop, and then continues to decline steadily as we age. Research has demonstrated that melatonin may have several profound long-term effects on the body. As one of the most powerful antioxidants ever discovered – with a greater range of effectiveness than vitamin C, vitamin E, or beta-carotene – melatonin helps prevent harmful oxidation reactions from occurring. In this way, melatonin may prevent the changes that lead to hypertension and heart attack; and may reduce the risk of certain kinds of cancer. Indeed research has indicated that many age-related problems are caused by declining levels of melatonin, which leaves the body less able to prevent and repair oxidative damage. Melatonin has also been found to stimulate the immune system; has a major role in the production of estrogen, testosterone, and possibly other hormones; helping to prevent cancers involving the reproductive system; and slow the growth of existing malignancies. Recently studies suggest that if melatonin is taken in the mornings, tumor growth may be stimulated, but if it is taken in the evenings, it has a retarding effect on tumor growth. In addition, as melatonin is secreted cyclically, in response to the fall of darkness at the end of each day, the hormone helps our bodies keep in sync with the rhythms of day and night. 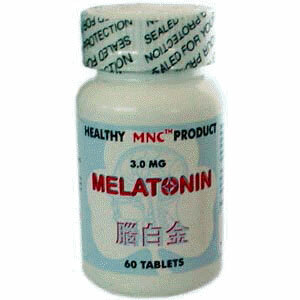 Thus melatonin helps regulate sleep. Human research studies and anecdotal evidence indicate that melatonin supplements can be an effective and side-effect-free sleep aid both for adults suffering from insomnia and for children with autism, epilepsy, down syndrome, cerebral palsy, and other problems that can cause sleep disorders. Melatonin should be taken 2 hours of less before bedtime. This schedule is designed to release added hormone at the same time that natural production peaks. As a dietary supplement, take 1 or 2 tablets before sleep.